Colored leaves everywhere, on the trees and on the ground. I can see them outside my window, on Forstenrieder Allee in Munich, where the G. Henle offices are. Colored leaves everywhere – that's the keyword for today's entry on the Schumann Forum: Schumann's seldom played "Bunte Blätter" opus 99. An additional page reference for "insiders" be mentioned here: an album exists on this theme with a handwritten note in Clara Schumann's pen "for Miss Julie Schmittermeyer in commemoration", January 1856 (Vienna) (Universitätsbibliothek Frankfurt am Main, Signatur: Hs 2355). Both cycles of variations, by the way, were published at the same time, in November 1854. At a time when Robert Schumann had already spent eight months as a patient in the private hospital of Dr. Richarz in Endenich. » Levels of difficulty of "Bunte Blätter op. 99"
On first glance you might feel inclined to think the piece is a chorale, the melody of the soprano voice is church-like, carried, almost monotonous, and suspended in the style of a four-part hymn. I am convinced that similar songs could be discovered in a Christian songbook. But it is not a hymn, it was newly created by Schumann "in the traditional style". The chorale idiom in combination with the very simple formal structure appears "antiquated" to us, like a citation from an earlier, long ago time. And that is seemingly not enough, in the first "album leaf" Schumann makes use of the gesture of the (baroque) gavotte. This usually hasty dance, here frozen as in slow motion, is characterized by the metrics short-short-long. I would say "Der Dichter spricht" (the last piece of the "Kinderszenen" op. 15) is related to our album leaf in this respect. Don't you think so, too? Perhaps the gavotte "idiom" was the main thing that prompted Clara Schumann, and especially Johannes Brahms to use exactly this album leaf as an inspiration for variations; already during Bach's time gavottes were popular templates for variations, and in addition we know that Brahms very much favored variations of old music forms. I mentioned above that the album leaf in f sharp minor appeals to me especially in its melancholy. I am moved to believe that it is exactly Schumann's reference to the old themes of the gavotte and chorale that make me feel this way. But the decisive element, what is really so intriguing about this piece, is the way it combines the old with the completely novel. And what is novel is the harmony. What Schumann does is to consistently repeat the melody of part A, almost like a formula, and combine it with ever-changing chords in the underlying (harmonic) structure. The effect is astonishing, because it proceeds to vary the illumination of the simple melody to create ever changing "colors": In the first four-measure unit we remain in f sharp minor, the next four measures take us from f sharp minor to A major, and the following four-measure unit (= mm. 17-20) leads us from the diminished seventh chord a#, followed by a cadence in A major, only to finally return to the f sharp minor of the first four measure unit. And above that, all the while the same four measure melody continues. Astonishing, isn't it? And then there are the seventh and ninth chords, always on the stressed measures 2, 6, 18 and 22. Try it out on your piano; play the first four measures and pay special attention to the effect of measure two, first beat. You will suddenly feel the pleasantly sharp dissonance of the chord in the pacing symmetry of the gavotte. You must allow yourself the enjoyment of this harmonic spice, so to say – and you will see how the little piece develops depth and greatness. For, it is exactly this chord that is the repeated little climax in the inner development of the movement: for this short instant motion halts on the dotted c#2 – in the base voice we make out a d (major seventh) or a b (major ninth) – the sharpest of disharmonies, actually. It makes you hold your breath. The "false" bass deeply enriches the traditional four-part chorale passage. All the other voices in the chord progress properly and meet our logical musical expectations. This is how, in these passages, Schumann creates four-part chords, inconceivable in the baroque or classic period, because it simply wouldn't go. I find it is these four-part chords (triads with major sevenths or major ninths) that really determine the dynamics of the piece. They actually become independent; they have their own sound value, and on top of that always positioned in the metrically stressed centre of the sequence of measures. And in my opinion these seventh or ninth chords are what, along with the "antiquated" framework of the choralesque gavotte, create the melancholy mood. They gently color the "pure" triad by impressively integrating a fourth, actually disruptive, note. Even if you, dear readers, should not agree with me that the mood is melancholy, then surely, though, you will agree that the coloration of the triad in f sharp minor with the added bass d or b is about "colored leaves" in a related sense, namely in the sense of being "chromatic" and thus having to do with color. Incidentally, if you were to analyze this dissonant chord with the usual tools of harmonics, you would most certainly be confronted with terms like "false conclusion" or "mediant", suspended note or VI. degree. All of which undoubtedly applies, but has nothing in the least to do with the true effect (!) of our piece. Don't you agree? To conclude, the diminished chord in measure 17 that is dissolved in the colored f sharp minor chord in measure 18 deserves to be mentioned. This diminished chord (m. 17) is the only one in the entire piece that Schumann explicitly marks with a sustaining pedal sign. And not only in order to integrate the grace-note a# into the chord sound of the left hand (the chord could not be grasped without the pedal), but also to create an audible contrast for the spherically diminished sound with the help of the pedal. Because, if you do not listen very closely, you will not notice that this is exactly where the repetition of part A sets in. The diminished chord again covers up and adds color to the rather simple melody. These colorations are what make the little album leaf from opus 99 so appealing. And it fits in so beautifully with the slightly melancholy autumn mood that we should abandon ourselves to with Schumann, when we now listen to the piece. 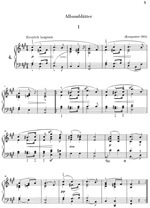 It is played by Mikhail Pletnev, a grandiose Schumann pianist, whose style I find exciting and inspiring ("exciting" in two meanings of the word: he fills each note with vivacity and depth, but often plays rather willfully, almost stubbornly, especially in his emphasis of polyphone voice leadings). Be it as it is, he plays our album leaf beautifully and exactly as it should be played. One is almost moved to bow in gratitude.